Barking & Dagenham wrapped up their third successive London Multisport Final title at the Copper Box Arena at the Olympic Park with another thoroughly dominant display. The team comprising pupils from Dagenham Park, Eastbrook, Jo Richardson, Riverside Bridge, Robert Clack, Sydney Russell and Trinity schools won every event except the track athletics to become the first team ever to be crowned London champions three years in succession, as well as the first to accumulate five titles overall since the event began in 2005. Their victory was the culmination of a year-long event encompassing all London Boroughs, 16 qualifying competitions, 30 teams and 1,500 competitors. The Champions Final and the Plate Final, which took place simultaneously, saw 200 young people take part from 24 schools. Barking & Dagenham’s victors’ trophy was handed over by special guest, Baroness Tanni Grey-Thompson, winner of 11 Paralympic gold medals. She commented: “Panathlon is amazing because it brings sport and physical activity to a range of people who might not be so easily able to access it otherwise. 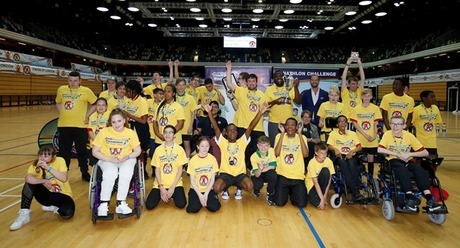 “What's really important is that Panathlon gives these young people the confidence to have a go, compete in front of their friends and with people watching them. It makes them feel really positive about themselves and builds an incredible team spirit between them. Barking & Dagenham finished with 60 points, an impressive victory margin of 12 over second-placed Enfield. Merton claimed bronze medals with 32, beating Croydon (also 32) by virtue of a higher peak score of eight points in table cricket. Amongst the victorious team was Georgina Hart, Panathlon's Jack Petchey Outstanding Achievement award winner back in 2015. She is currently working towards the GB team and potential future Paralympic appearance in her chosen sport of cub throwing and was featured on this year's Sport Relief for her work combatting bullying. She said: "I'm incredibly proud. No matter how many times I come here I'm always a little bit nervous but to win gold again is a dream come true." Taking place simultaneously across the other side of the vast Copper Box arena was the Plate final for teams who had lost in the first round but then won their respective Plate Regional Finals to reach this final stage. Debutants Waltham Forest (comprised of students from Whitefields, Brookfield House and William Morris schools) were crowned winners with 54 points, edging out Bexley (46), Harrow (38) and Merton (30). Before the action began, the traditional Panathlon Oath was read out by Croydon team member Ellie Bowen, 14, of Riddlesdown College. “It really meant a lot to me to do that,” she said. “I was a bit nervous though, don’t ask me to do it again!” Ellie was thrust into the role as the planned Oath reader, Rukshar Ahmed of Kingsley High School, sadly arrived too late to take to the microphone. Many thanks to our sponsors Jack Petchey Foundation, St. James’s Place Charitable Foundation, Woodland Group, John Lewis Stratford City and Mayor of London.